Stock photo of wine barrel and sign at the entrance to Mission Hill Family Estate Winery, Westbank, West Kelowna, Kelowna, Okanagan, British Columbia, Canada. Wine barrel sign at entrance to Mission Hill Family Estate Winery, Westbank, West Kelowna. 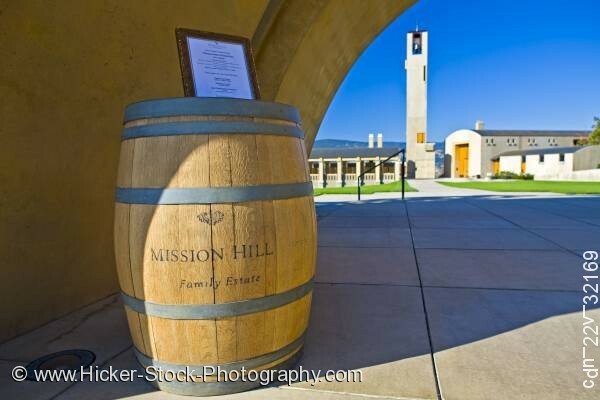 This stock photo shows a wood and metal wine barrel and sign at the entrance to Mission Hill Family Estate Winery, Westbank, West Kelowna, Kelowna, Okanagan, British Columbia, Canada. A wine barrel made with wood slats and metal rings sits at the arched entrance to the Mission Hill Family Estate Winery. On top of the wine barrel is a sign set in an attractive frame. The barrel sits on concrete sections that lead buildings and a tower in the distance. Steps with a metal railing and a walkway leads to the tower with beautiful manicured lawn on each side. Bright blue sky and dark mountains sit in the far distance of the winery add to the attractive scenery.